My name is Nelly Bromberg, I am 18 years old and I am from Mexico City. I just graduated High School and I plan to start Medical School this coming January in Mexico. All my life I studied in a Jewish school, so I have always have a special bond with Israel. This is why I decided to come with Aardvark for a semester before starting university. I chose this program because I was looking for a meaningful experience and to be able to fully learn about and immerse myself into the Israeli society, and Aardvark as the prefect program to help me do it. During my previous times in Israel I always got impressed with the modern and advanced country that it s, and since then, I had the feeling that I needed to give something back to this country, that gives us, as Jews so much. This is why my favorite part about the program is the volunteering. At the begging I was a volunteer at an elementary school called Droyanov. There we helped mostly in the English classes. We helped the students to improve in their writing and reading. This was a great opportunity for me to get to know how Israeli children live and learn, and I loved that I was able to practice my Hebrew. But it wasn’t until my second volunteer opportunity that made me feel really happy and satisfied. For the second part of the semester I decided to volunteer with Magen David Adom. For this I needed to complete a basic 60 hour course to be certified as a first responder. During this 10 day course in Jerusalem I learned everything I needed to know to volunteer in ambulances. We learned things like first aid, CPR, choking, trauma, wounds, burns, fractures, seizures and other interesting topics. After a difficult exam I was certified as a first responder and I got to volunteer in the ambulances. 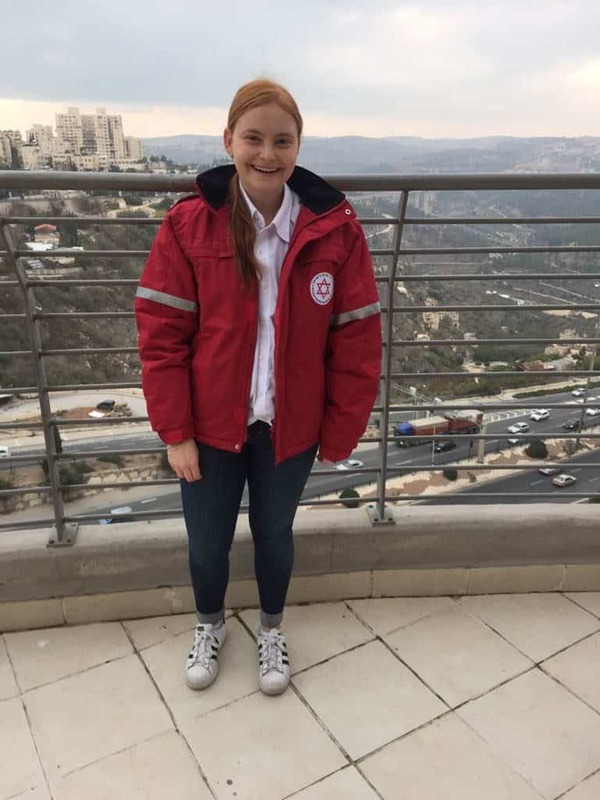 During my time in Israel it was obvious for me that I needed to be a part of Magen David Adom Overseas Volunteer Program, since I wanted to have a medical related meaningful experience. Every call was so much more than taking an old lady to the hospital, more than calming a worried mother stressed for her unconscious baby, and more than listening to that teenage girl with suicidal thoughts. It was more than taking the pulse or blood pressure a thousand times per day or changing sheets countless amount of times. I learned so much about the healthcare system in Israel, and I really got to know Israeli society. Working with Jews, Arabs, native born Israelis, people that made Aliyah, older, younger or people my age gave me an outlook on how life is in this country. I also got the opportunity to see how different Israelis live, how are their homes, schools and even got to see interesting places like a prison or a military base. Aardvark definitely gave me a great opportunity to be more independent and to really grow as a person. The Madrichim and the teachers were really helpful and made this experience even more meaningful. I loved that I felt truly free in Israel, that I was able to live as a local, to travel on a bus and to really feel Tel Aviv. I really like how Aardvark gave me the opportunity to give something back to Israel with the volunteering and I can definitely say they made my love for Israel even bigger.